There is no society so widely known, and yet so little known, as that of Free and Accepted Masons. Even many in the Craft are uninformed of our eventful past, despite the lessons from the ritual of the three Blue Lodges degrees. The actual history of the Craft, extending over a period of some six centuries, and that of its grand structures, during ages now fittingly described by the term "Time immemorial," appears to have been relegated to a back seat and frequently overlooked. Some of our temples, so spacious and magnificent, are the result of more prosperous times when the cost of construction is considered. One such imposing edifice is the Springfield temple at 339 State St. Built in a neighborhood of other buildings of architectural splendor, the cornerstone weighing approximately two tons, was laid by M.W. and Rev. Dudley H. Ferrell on St. John's Sunday, June 24, 1924. One month earlier the cornerstone of the Shriner's Hospital on Carew St. was laid. 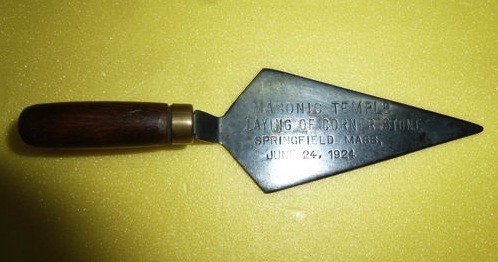 Placed in the temple cornerstone box was a picture of the Grand Master (1923-25), documents including Lodge notices and membership lists, a Henry Price Medal, a souvenir trowel, photographs, and the Past Master's jewel of Samuel D. Sherwood that was given him by Roswell Lee Lodge of Springfield. 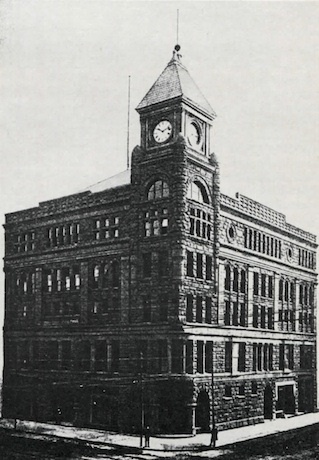 When the building was beautified and adorned and its several parts fitted with such exact nicety, it was dedicated by M. W. Frank L. Simpson on Feb. 15, 1926. Completed at a cost of one million dollars, one can only hazard a guess as to what the cost might be in 1988. The building is unique in its many features, such as Indiana limestone and light brick, cork floors in Lodge rooms, mosaic floors of Tennessee marble, Greek and Doric columns, a marble stairway, a 1,500-seat auditorium with two organs, a huge banquet hall, several meeting rooms, a library, and a large well-equipped kitchen. The original pipe organ is now silent but a Wurlitzer organ provides all the music and sound needed. The largest Masonic building of its kind in the northeast, it has earned a place in the National Register of Historic Places. Stairways or an Otis elevator whisk one to the six floors, each one containing a rest room. TROWEL 's guide, Bro. Clarence Mclntire, pointed out the many pictures of the Past Masters of the Lodges meeting there and, in particular, a huge eight-by-ten-foot picture of every member of Springfield Commandery # 6, taken in May 1888. Cutouts of each member's head are placed with the largest in the front row and reduced in size in each of the sixteen rows. This was the work of master craftsman Chauncy L. Moore. Lodges meeting in the temple are Hampden (1819), Chicopee (1848), Roswell Lee-Samuel Osgood (1864), Esoteric (1901), Springfield (1894), and Samuel D. Sherwood (1921). All meetings of the Fifth Lodge of Instruction are held there as well as Scottish Rite Bodies and Connecticut Valley Consistory. Other bodies meeting in the building are Morning Star Royal Arch Chapter; Springfield Council, Royal and Select Masters; Springfield Commandery No. 6, Knight Templar, and Adelphi Chapter and Springfield Chapter of the Order of the Eastern Star. There is no DeMolay Chapter or Rainbow Assembly in the city. Within three years of the dedication of the temple, the world faced a financial depression that left its mark on every American family. Large pledges to the temple could not be paid and in 1937 the Springfield Five Cents Savings Bank executed its foreclosure rights. In 1940, Bro. Gurdon W. Gordon, Esq., came to the rescue and bailed the temple out of its financial dilemma. A permanent fund, like that in Grand Lodge, Boston, was finally established, funds from which will help to keep the temple that measures 166 feet by 180 feet and 102 feet high, in repair. During the years that followed the depression the temple was neglected due to the lack of funds and it fell into disrepair. Walls and ceilings were badly damaged by water leaking through the roof and from broken drains. In 1977 the decision was finally made to repair it or abandon it. E. Raymond Turner, a Springfield attorney, was elected President over the Temple Corporation and immediately became master and overseer of the Workers of the Temple who spent the next ten years repairing and painting. A Mason since 1939, Bro. Turner would often begin his day at 9 A.M. and work until 5 P.M. with a transistor radio for company. A native of Hopedale, he moved into the city in 1950. Rabbi Stephen S. Wise once declared: "Give yourself to something great, enroll under the banner of a high cause, choose as your own some standard of self-sacrifice, attach yourself to a movement that makes not for your own gain but for the welfare of men, and you will have come upon a richly satisfying as well as engrossing adventure." Ray Turner did just that and when he had completed his work he passed the reigns of the temple on to another. The highlight of the restoration has been the formation of the Springfield Masonic Library Foundation, a charitable trust that has been approved by the IRS. The library on the lower floor contains Masonic books and literature as well as other reading material and is open to the public. In 1986 Grand Master David B. Richardson dedicated the E. Raymond Turner Library and was assisted by Melha Temple Potentate John E. Bethel, Mayor Richard E. Neal, and Congressman Edward F. Boland. A flag that had flown over the Capitol in Washington was given by Cong. Boland. A suitable plaque and picture of Bro. Turner hangs on the wall beside the flag. A feature of the library, adjacent to a pool and billiard room is a Masonic road marker embellished with the square and compasses, the sun, the moon, a star, pillars, and steps, and placed in 1763 by Bro. Joseph Wait who had been lost in a blinding snowstorn. He erected the milestone marker to direct future travellers on the Boston Post Road. Storm windows were attached to the windows on the first three floors, circulating fans were installed in two first floor Lodge rooms, and a new burner put in the furnace that has reduced oil consumption by about 200 gallons a month. Bro. Turner and his workers have more than made their contribution to the Craft. "It's been a labor of love," is what you might expect a real workman in the Craft to admit. He is one Speculative Mason who easily adapted himself to Operative Masonry, and because of he and the other Workmen in the Temple, the facility has been beautified and adorned. Esoteric Lodge, from 1909 to its merger with Samuel D. Sherwood Lodge in 2006. Esoteric-Sherwood Lodge, from 2006 to 2009. Friendly Society Lodge, meeting part time in Southwick from 1810 until the surrender of its charter in 1834. Hampden Lodge, from 1817 to its merger with Roswell Lee-Indian Orchard Lodge in 2003. Indian Orchard Lodge, from 1911 to its merger with Shawmont Lodge in 1982. Indian Orchard Masonic Lodge, from 2004 to the present. Indian Orchard-Shawmont Lodge, from 1983 to its merger with Roswell Lee-Samuel Osgood Lodge in 1997. Roswell Lee Lodge, from 1864 to its merger with Samuel Osgood Lodge in 1979. Roswell Lee-Indian Orchard Lodge, from 1997 to its merger with Hampden Lodge in 2003. Roswell Lee-Samuel Osgood Lodge, from 1979 to its merger with Indian Orchard-Shawmont Lodge in 1997. Samuel D. Sherwood Lodge, from 1921 to its merger with Esoteric Lodge in 2006. Samuel Osgood Lodge, from 1921 to its merger with Roswell Lee Lodge in 1997. Shawmont Lodge, from 1952 to its merger with Indian Orchard Lodge in 1982. Springfield Lodge, from 1894 to its merger with Newton Lodge in 2002. 12/09/1874: 1874-114; Hall dedication reported in the Grand Master's Address at the December Quarterly. (held 06/24/1874). 10/21/1892: 1892-131; Hall dedication, at a Special Communication. 10/24/1893: 1893-91; Hall dedication, at a Special Communication. 10/24/1914: 1914-291; Hall dedication, at a Special Communication. 09/26/1959: 1959-231; Corner-stone laying of Melha Temple, at a Special Communication. It is a matter of regret that our brethren in Springfield, Mass., have been made to suffer loss by fire; they had many rare and valuable things in their apartments, many of them hard to be replaced, some of them not at all. 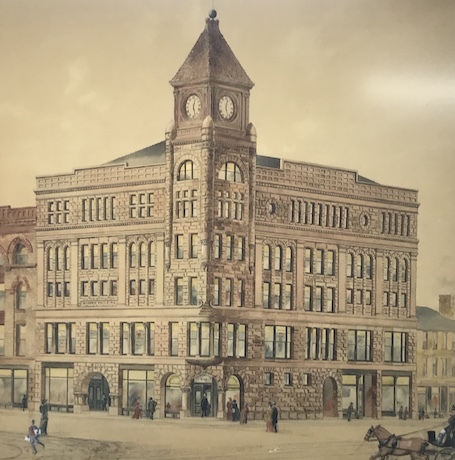 The Boston Herald printed a special dispatch as follows: " he five-story brown stone front building of the Massachusetts Mutual Life Insurance Company on Main Street was damaged by fire this afternoon (February 9th,) the loss being variously estimated at from $20,000 to $30,000. The first floor was occupied by Woodbury, Moulton & Stearns, investment bankers, and by the Springfield Safety Deposit Company; the second and third floors by the Massachusetts Mutual Life Insurance Company; and the fourth and fifth floors by Springfield Commandery Knight Templars, Morning Star Chapter Royal Arch Masons, Springfield Council Lodge of Perfection and Princes of Jerusalem, Roswell Lee and Hampden Lodges, F. & A. M. The fire started on the fourth floor, in an ante-room, and had gained considerable headway when discovered. In an hour the firemen had the fire under control. The flames were confined to the two upper floors, and most of the damage was done by water. The loss of the various Masonic Lodges aggregates $10,000, the loss on the building itself is $15,000, and the damage done to the furniture in Woodbury, Moulton & Stearns's office, is estimated at $15,000. All these damages are fully covered by insurance. The fire probably caught from an electric light wire." More than 5000 members of Masonic bodies in Springfield, Mass., and nearby cities and towns, participated in the parade and other exercises attending the laying of the cornerstone Tuesday, June 24th ef the new $1,000,000 Masonic temple in State Street. Several thousand more spectators viewed the ceremony and listened to the addresses, the speakers' voices being carried to the edges of the throng of spectators by amplifiers. Nearly 3000 took part in the parade through the business district, ending at the new temple. The cornerstone was laid by the Most Worshipful Dudley H. Ferrell of Lynn, Grand Master of Masons in Massachusetts, and his official suite. Mayors Edwin F. Leonard of Springfield and Norman B. Stevens of Hartford, and E. A. Blodgett, president of the Masonic Hall Association, assisted in spreading the cement. After the two-ton stone was lowered and leveled, the ancient ceremony of consecrating the stone with corn, wine and oil followed. The new temple of the Springfield (Mass.) Masonic Hall Association was dedicated February 16th in accordance ancient rites by Most Worshipful Frank L. Simpson, of Boston, Grand Master of Masons of Massachusetts and his suite. The completed building, considered one of the finest of its kind in the country, represents well upward of $1,000,000. Precedence in the dedicatory rites was given to Hampden Lodge, organized in 1817, the oldest in the city. The cornerstone was laid twenty months ago. 06/24/1924: 1924-335; Corner-stone laying, at a Special Communication. 02/16/1926: 1926-29; Corner-stone laying, at a Special Communication. Through the concerted effort of an active Board of Directors the Springfield Masonic Temple, located at 339 State Street, is getting a restoration near to the building that was dedicated February 15, 1926. For too many years the building had suffered from neglect and was allowed to fall into disrepair to the extent walls and ceilings had been damaged by water leaking through the roof and broken drains in the walls. One of the highlights of the restoration program is the formation of the Springfield Masonic Library Foundation, a charitable trust that has been recognized by the IRS. The library will include Masonic books and artifacts for the benefit of both the Fraternity and the public. A special feature of the library is a Masonic Road Marker that is embellished with Masonic markings on loan to the temple from the City of Springfield. The marker dates to 1763 when it was erected by a Brother to direct travelers to Boston. It is possible the marker is the oldest of its kind in America. Masonry's roots in the Springfield area go back to 1817 when Colonel Roswell Lee organized Hampden Lodge that is still in existence. Brother Lee was the Commandant of the Springfield Armory. 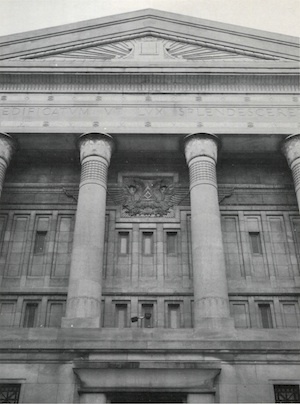 Constructed of Indiana limestone, with cork floors in the Lodge rooms, mosaic floors of Tennessee marble, Greek Doric stone columns, and a marble stairway, the Temple's cornerstone was laid June 24, 1924. When completed the cost had reached one million dollars. A permanent fund has been established for the first time. The kitchen has been remodeled, roof and drains repaired, and several rooms are now in the process of being repainted. The splendor of the Springfield Temple has gained the favor of the Springfield and the Commonwealth of Massachusetts Historical Commissions. Through their approval the Temple has been recommended an historical designation to the Federal Historical Commission that, when approved, will include the Temple in the Federal Registry of Historical Buildings. Masons in the Springfield area are now pointing toward the spring when they will celebrate the 60th anniversary of the laying of the cornerstone. No specific date has yet been chosen but we can be sure it will be a gala occasion that will properly befit the new look for the Springfield Masonic Temple. President, Springfield Masonic Temple Association, Inc. This page was last modified on 12 March 2019, at 07:49.